In this photo provided by the United Nation's World Food Program, a North Korean eat their lunch at a government run nursery in Pyongyang October 18, 2005. The United Nations is calling for the international community to put aside political differences and boost funding to help address what it says are the dire humanitarian needs of North Koreans. The U.N. said Tuesday that aid efforts in North Korea remain "seriously underfunded," even as it unveiled a funding request for an additional $198 million to respond to "key humanitarian priorities" in the impoverished communist state in 2012.
International donors provided just over a third of the $218 million the U.N. requested for North Korean aid in 2011. Because of the lack of funds, the international body said it was unable to effectively address the humanitarian needs there. The U.N. described serious humanitarian conditions in North Korea in its report, saying 16 million people continue to suffer from chronic food insecurity, high malnutrition rates, and deep-rooted economic problems. It said undernourished children are particularly at risk, with nearly a third of children under five showing signs of stunting and hundreds more dying from preventable conditions such as diarrhea. U.N. Resident Coordinator Jerome Sauvage called on donors to separate political issues from humanitarian needs in North Korea, which has been under international sanctions because of its nuclear program. "We think that humanitarian assistance should be not dependent on the ups and downs of the political situation," Sauvage said. "As we said, this [assistance] is going for the most vulnerable people, and certainly, if we see our funding going down for whatever reason, this is what is happening really to affect the population. We think that humanitarian aid should be separate from politics." North Korea has suffered from chronic food shortages since a famine in the 1990s believed to have killed hundreds of thousands of people. The United States and North Korea reached an agreement in February under which the North had agreed to suspend its nuclear weapons and missile programs, in exchange for a delivery of 240,000 tons of badly needed food aid. But Washington scrapped the deal after North Korea's failed rocket launch in April. Pyongyang said the launch was to place a weather satellite into orbit, but the Obama administration argued it was a test of a long-range ballistic missile that could carry warheads. 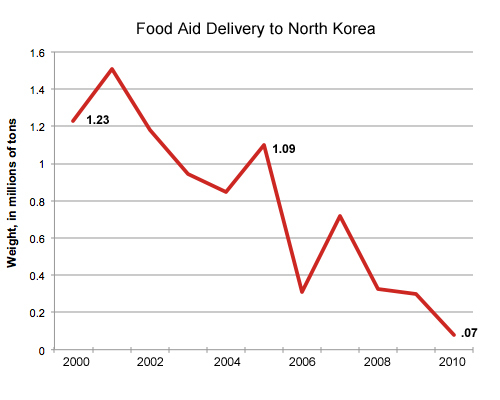 Despite its political differences with North Korea, the U.S. has been the biggest single contributor of food aid to the communist state since the famine.